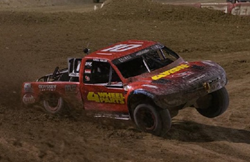 Greg Adler and Team 4 Wheel Parts took the Pro4 battle to Las Vegas, Nevada this past weekend for the Lucas Oil Off Road Racing Series Fight Under the Lights at Las Vegas Motor Speedway. 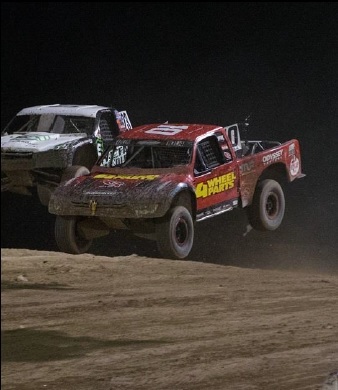 With the 2015 short course off-road racing season quickly winding down, rounds 15 & 16 of series action electrified the capacity crowds as the greatest show on dirt didn’t pull any punches under the lights in Las Vegas. We were dicing with the class champion for that third spot and were holding him off. Eventually he snuck by us and we had to settle for 4th, but in a race like this, it feels like a solid finish to the night. The event’s location also provided Adler the opportunity to visit the recently opened 4 Wheel Parts store in Las Vegas and interact with the employees of the company’s flagship store who later joined Team 4 Wheel Parts to take in the off-road chaos at Las Vegas Motors Speedway. And chaos it was. While a roll during Adler’s qualifying effort placed him towards the back of the field to open the weekend with Round 15 on Friday night, ultimately the position kept him out of the bedlam and allowed him to work his way through the field to a 4th place result. The next evening saw Adler taking the green flag on the front row, the byproduct of a strong qualifying effort and a friendly draw. Now in second place and charging just behind the leader, he maintained his position as the field pursued tight on his bumper. After a handful of laps, Adler blasted into a corner and locked up his brakes forcing the truck to stall and allowing a number of trucks to roar past. Undeterred, he re-fired the 900 HP Pro4 and inserted himself back into the fray. Through the 16-lap battle he picked his way through the course, landing himself a hard fought 7th place outcome. The Lucas Oil Off Road Racing Series will come home to Southern California on October 24-25 for the climactic season ending doubleheader featuring the 4 Wheel Parts Off Road Nationals and the Lucas Oil Challenge Cup back to back at Lake Elsinore Motorsports Park. 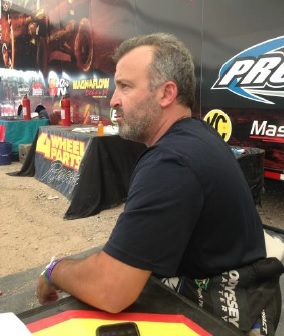 Follow Greg Adler Motorsports on Twitter, Instagram, Facebook and Team4WheelParts.com. There is nothing like being in the grandstands and hearing the roar of 900 HP trucks as they fly through the air, but if you can’t be there in person, the Lucas Oil Off Road Racing Series is broadcast throughout the season on CBS, the CBS Sports Network and MAVTV.